'House Of Cards' Is Built To Last Two new dramas fueled by intrigue premiere this week: The Americans on FX and House of Cards on Netflix. While The Americans has its moments, House of Cards is the show that's going to make television history. 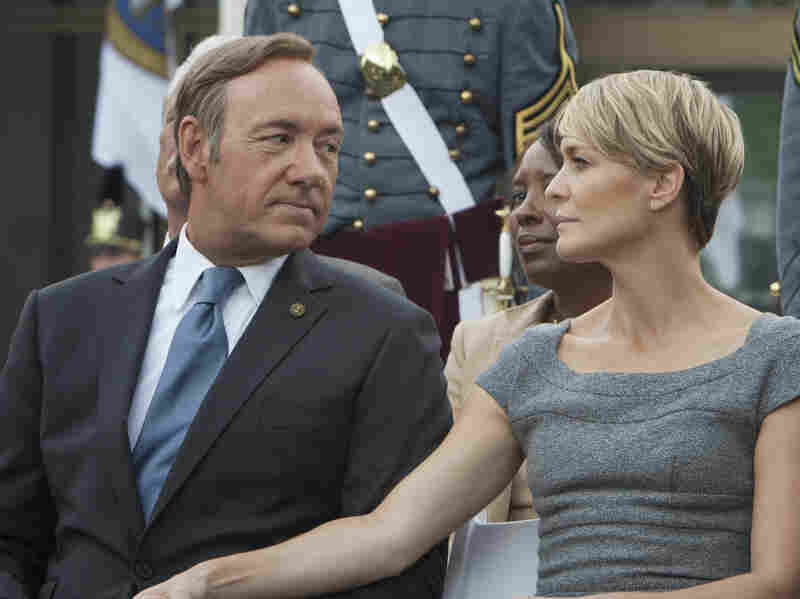 Kevin Spacey and Robin Wright star in the new Netflix original series House of Cards, which premieres Feb. 1. Both of these new series are all about intrigue, and they set themselves apart from the TV pack in both setting and style. Based on their first episodes, House of Cards, which stars Kevin Spacey, is the more artistically successful of the two, but both new shows are impressively ambitious and interesting enough to follow, to see how much they'll develop. Both of them are better than any new broadcast network series this season — and neither comes from a broadcast network. House of Cards doesn't even come from a network. But more on that in a minute. Let's start with The Americans. It's created by Joe Weisberg, a former member of the CIA, and its executive producers include Graham Yost, creator of another FX series, the excellent Justified. The premise of The Americans takes something from today's headlines — a concern about sleeper cells of foreign terrorists on American soil, blending in and waiting for orders — and flips it. Instead of modern times and al-Qaida, The Americans takes place in 1981, shortly after Ronald Reagan's first inauguration — when the Soviet Union was feared, Reagan was newly elected and the Cold War was heating up again. We meet a pair of Soviet agents who were given the assignment of an arranged marriage and moved to America more than a decade before, and who now live in the Washington suburbs with their two children, cover jobs as travel agents, and even a house with an actual white picket fence. And we're asked to empathize with them and root for them, despite their allegiances and activities. No doubt that's why the central roles have been cast with extremely likable actors. The husband, whose American cover name is Philip Jennings, is played by Matthew Rhys, who played Kevin on ABC's Brothers & Sisters. And Philip's wife, Elizabeth, who loves the KGB more than she loves her assigned husband, is played by Keri Russell, star of the WB series Felicity. The Americans provides both of them with dream roles. In the premiere, both Philip and Elizabeth adopt other disguises and identities to solicit information from targets — then return home, where they play the roles of ordinary mom and dad. Flashbacks flesh out their initial introduction and uneasy relationship, and there's a new wrinkle thrown at them early on: An FBI counterterrorist agent and his wife move in across the street, and the sleeper agents don't know if that's a coincidence or if the government suspects them. Either way, I suspect that Noah Emmerich, the actor playing the FBI agent, may steal this show. He's the real sleeper here — and though I really like Russell's tough new persona, The Americans truly comes to life whenever Emmerich shows up. At least initially, though, it bogs down a bit during the flashbacks, which are too straightforward; and one action sequence, which has Philip and Elizabeth bonding a little as they embark on a dangerous mission together, makes a serious musical misstep. As they set off — without saying a word to one another as they go through their various spy motions — we hear on the soundtrack one of the most iconic music cues in all of TV history. It's an homage, certainly, and a song that is true to the '80s era. But when I heard it, instead of pulling me more deeply into the drama, it made me laugh. If you were around during the decade when The Americans takes place, it's impossible to hear Phil Collins' "In the Air Tonight" without thinking of Miami Vice. Other period music is used more effectively, but that's one that should have been avoided. Robin Wright plays his equally ambitious and cold-blooded wife, Claire, and they're both like characters straight out of Shakespeare. She's Lady Macbeth, with her own insatiable drive and ambition — and he's Iago, the evil lieutenant who manipulates everyone above and below him. House of Cards, on the other hand, hits the perfect tone right from the start. It's based on a wonderful British miniseries from 1990, which starred Ian Richardson as a career politician who spoke to the camera directly as he schemed and charmed his way through the corridors of power. That version, based on the novels by Michael Dobbs, was adapted by Andrew Davies, who wrote Bridget Jones's Diary and the TV versions of Bleak House, Pride and Prejudice and Vanity Fair. This new American version is adapted by Beau Willimon, who replaces the House of Commons with the House of Representatives, an incoming prime minister with an incoming president, and lots of other details that make this new House of Cards the best TV series about American politics since The West Wing. In both the British and American versions of House of Cards, the central character is the majority whip — played, in this 2013 incarnation, by Kevin Spacey, who, as Frank Underwood, is perfectly ruthless and ruthlessly perfect. And Frank, like many a character from Shakespeare, often pauses to address his audience directly, and privately, to reveal his innermost thoughts. He's giving a soliloquy — but, as in a scene when he pauses during a re-election party to turn to the camera and speak, he turns us viewers into unindicted conspirators. 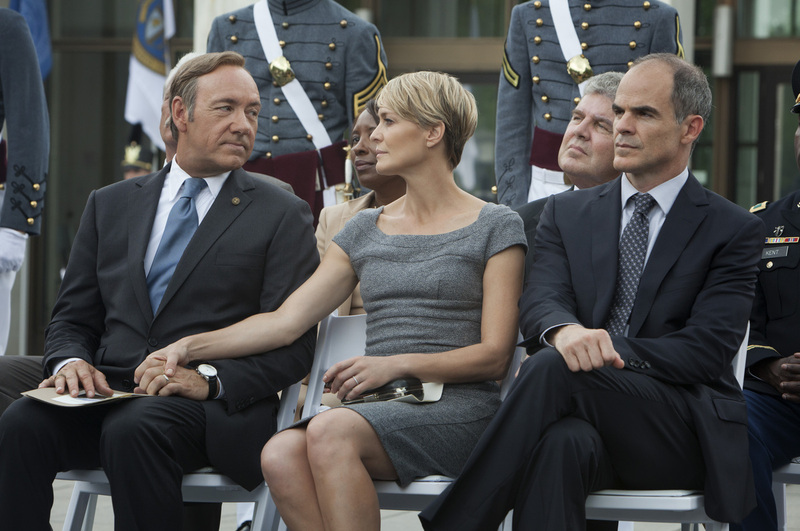 Filmed on location in Baltimore and Washington, D.C., House of Cards looks and feels authentic. And series creator Willimon knows this world well: Before and after becoming a playwright, he was a campaign worker for Chuck Schumer, Hillary Clinton, Bill Bradley and Howard Dean. The way Spacey's Underwood manipulates the press — embodied here by Kate Mara as a young newspaper reporter and blogger — is especially smart and credible. But all of House of Cards is intriguing and exciting: The first two episodes I previewed are so good and so addictive, I can't wait to see more. And starting Friday, I won't have to. That's when Netflix, which presents House of Cards, unveils not just the pilot, but all 13 episodes of the show's first season. Fans of the series, once they find it on Netflix's streaming service, can dive into some serious binge viewing and watch season one as fast as they want. This isn't the first time, on the Internet or on Netflix, that an original production has been presented this way, but House of Cards is by far the best yet. It is to Netflix what The Sopranos was to HBO, what The Shield was to FX, what Mad Men was to AMC. It's an identity maker and a game changer. And unlike all those others, House of Cards arrives all at once. If the broadcast networks, especially, aren't frightened by this, they should be. Netflix, this week, isn't merely making great television — it's making TV history.